Recently, topics about Handbrake 1.0.0 are increasingly fierce, among which the new support for VP9 encoder in Handbrake climbs to the top. Since non professionals or new comers have no idea about Handbrake VP9 profile, this article is aimed at explaining the Handbrake VP9 encoder, how to decode/encode VP9 in Handbrake with smaller size but better quality, and the related problems and solutions in encoding MKV VP9 codec with Handbrake. • Download VP9 codec videos from YouTube or 300+ video sharing sites. • No need to tweak parameter settings anymore and get smaller file size. Handbrake 1.0.0 was finally released on Christmas Eve after 13 years of development with a slew of amazing features, incl. add the support for MKV VP9 encoding via libvpx 1.5.0. VP9 is considered as the next-gen video compression format that is twice as efficient as VP8. More importantly, VP9, unlike H.265 (another 4K codec), is open and royalty-free. It halves the file size of 4K UHD, 1080p or 720p content yet remaining the quality the same as original, making it much easier for video transmission over slow connections. VP9 now occupies very great proportion of YouTube videos. Plus, Chrome, Firefox and even Microsoft Edge implements WebM VP9 codec as well, owning to the high efficient video compression ratio. Like many other tools VLC 2.1.2, FFmpeg, SUPER, MPlayer, Libav, DirectShow Filters supporting VP9 encoding, Handbrake 1.0.0 finally infuses new MKV presets for VP9 video encoding and Opus audio encoding with libvpx. That means you can use Handbrake 1.0.0 to convert video with VP9. By default, Handbrake 1.0.0 offers four MKV presets for VP9 at different resolutions and frame rates. You can directly choose the profile at your disposal. Follow the handbrake VP9 encoder guide below. To get the default VP9 profile, please make sure to download and install Handbrake 1.0.0 released on Dec 24, 2016. You have to bear in mind the Handbrake 1.0.0 requires to delete the older version and download Microsoft.NET Framework 4.6. If not, a message will pop up asking you to install it. Step 1: Launch Handbrake. Different from the previous edition, you can directly add a single file or a whole video folder at the left side and then wait for Handbrake scanning. Or just click the Source button to do so as before. Step 2: Click Browse button to choose the destination where you want to save the file. Step 3: Go to Presets - Matroska - VP9 MKV. 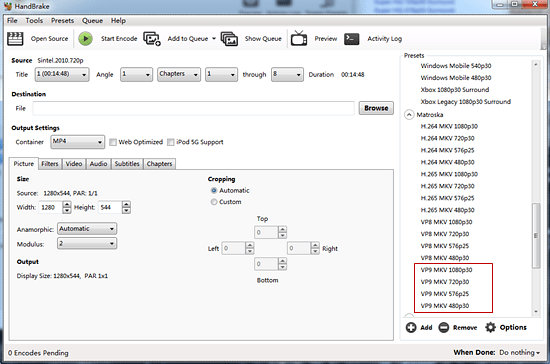 Handbrake offers 4 presets for VP9 MKV at resolutions of 1080p, 720p, 576p and 480p. It's at your disposal to choose to fit for your specific needs with balanced speed and file size, without needing to tweak the bit rate, resolution, codec, frame rate, etc. But you shall note that there is MKV VP9 encoding available. Note: If you use Handbrake Mac version, please go to the Video Encoder to choose VP9 manually as there isn't MKV VP9 preset in Handbrake Mac version. Step 4: Tap the Start Encode button to begin VP9 encoding with Handbrake. For experts at Handbrake who want a better image quality but smaller file size, you can additional go to Video on the main interface to tweak the parameter settings. Below are some suggestions before VP9 encoding in handbrake. Framerate (FPS): Choose Same as source and check Variable Framerate as it uses available space more efficiently than CBR and outputs less artifacts in the video. Quality: If you want to encode VP9 with smaller size, just lower the constant quality at below 22 as it will result in smaller size with acceptable quality. Or else, you can tweak the constant quality at 23 for balancing the quality and file size. Optimise Video: Set the Encoder Preset in the middle of the bar. Typically, if you higher the setting, it will output higher quality but leads to longer encoding time. 1. Handbrake VP9 encoder is still immature with many bugs. Tests show that Handbrake rips DVD to MKV VP9 only encoding part of MKV VP9 video during conversion and half crashes at 35% of DVD ripping. See how to solve "Handbrake doesn't convert whole movie" problem. 2. Users indicate that VP9 encoding on Handbrake is slow and takes 1h 40min as it only consumes a CPU utilization of about 55% based on a user feedback from Reddit. 3. Handbrake output videos in MP4 and MKV but only provides VP9 preset for MKV. 4. Though Handbrake 1.0.0 makes a big overhaul for its profiles, including Chromecast, Windows mobile, Xbox, Roku, Playstation, FireTV, Gmail, Android, etc, it still doesn't makes good compatibility with the latest gadgets, e.g. iPhone 7, iPad Pro, Samsung Galaxy S7, etc. There are far more errors with Handbrake, such as no valid source found or title found during DVD ripping, audio and video out of sync, etc. So if the open-source Handbrake isn't quite the best for VP9 video encoding, why not try a Handbrake VP9 encoder alternative? 1. No.1 fast speed: The unique support of Intel QSV makes it the world's fastest VP9 video transcoder, up to 3-5x faster than Handbrake. 2. Easiness: There are only 3 steps needed for video encoding. And the 400+ preset profiles for mobiles, webs, video editing tools make it much easier than ever to encode and decode video. You don't even need to tweak the parameter setting to balance the quality, size and speed. 3. 370+ video/audio codecs: It is built in almost all video and audio codecs, supporting converting any videos you throw at it, e.g. VP9, VP8, HEVC, H264, AVCHD, MTS, WMV, MKV, etc. 4. VP9 video download: Built-in online video downloader, it can download VP9 videos as well as other videos in 4K, HD or SD from YouTube, Facebook, Vimeo, etc. 5. Bonus: Add subtitles, watermark the VP9 video, trim/crop/erge video, record VP9 video, etc. 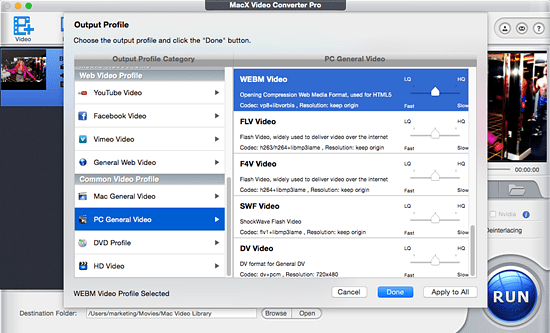 MacX Video Converter Pro is the best Handbrake VP9 encoder alterantive that promises you the most user friendly design and after-sale service. It gives you the No.1 fast video conversion speed and outputs high-quality image and sound. What are the best yet fastest video codec converters? Below is a blazing fast video converter with the widest range of codecs support such as H.264, Xvid, DivX, VP9, VP8, MPEG-4 etc.